Wine has been produced on the island since the early Bronze Age, with evidence of winemaking from over 4000 years ago. The history of Santorini has been shaped by the volcanic eruption that occurred around 1627 BCE. The eruption changed the landscape and coastline of the island and covered it in layers of different volcanic rock, leaving it deserted. The island was resettled a few centuries later and winemaking began again, with continuous production up until now. Unsurprisingly the soils on the island are volcanic; a variety of black, red and grey-white earths depending on strata and makeup. The roots of the vines grow in volcanic ash and pumice, which also assist in trapping any available moisture. 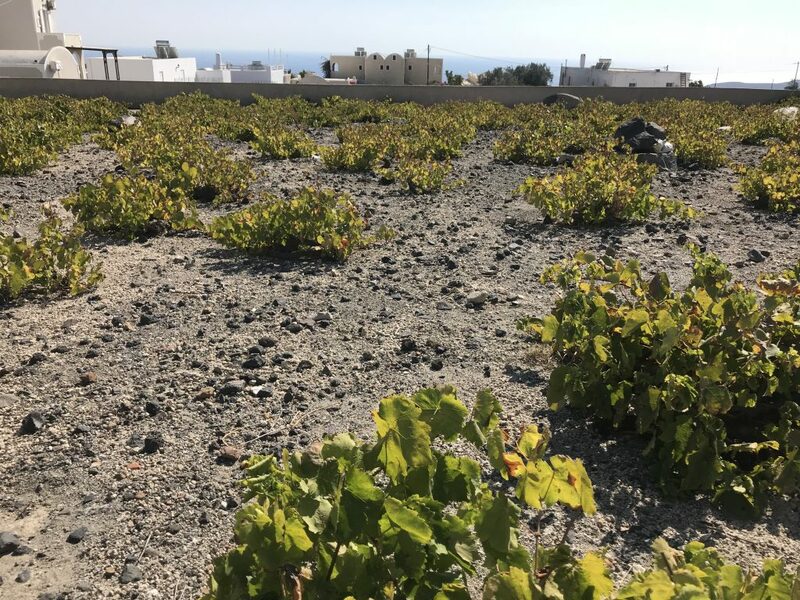 The root systems on Santorini are in some cases over 300 years old, burrowing all the way to the impenetrable subsoil in search of water and nutrients. Making wine in Santorini is very challenging. It is typically hot and windy and there is little rainfall. Irrigation is expensive and used only for nursery vines; it isn’t practical to irrigate vines throughout their long lifespan. The winds are often so strong they can tear flowers, leaves and bunches from untrained or trellised vines, and even cause photosynthesis to halt. Most of these challenges are met through a unique, ingenious training system. 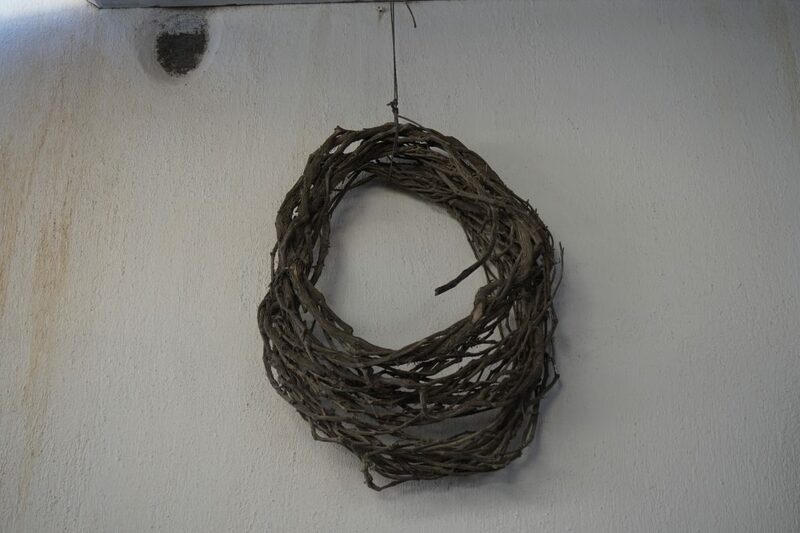 The majority of vines on Santorini are trained in a unique basket shape, with the leafy canopy sprouting from a ring of intertwined canes and the grape bunches growing on the interior. 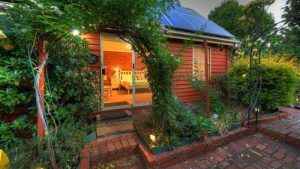 This system provides a number of benefits. The grapes are protected from the direct sun, and actually benefit from a longer growing period through the mitigating effects of the wind. The basket shape provides a catchment for moisture produced at night, providing a much-needed source of water. The hero grape of Santorini, and indeed Greece, is Assyrtiko. Assyrtiko has adapted to the harsh conditions to produce very lively wines. 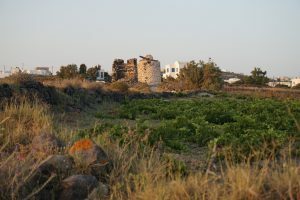 The most plantings, and most of the wine styles are based on Assyrtiko. 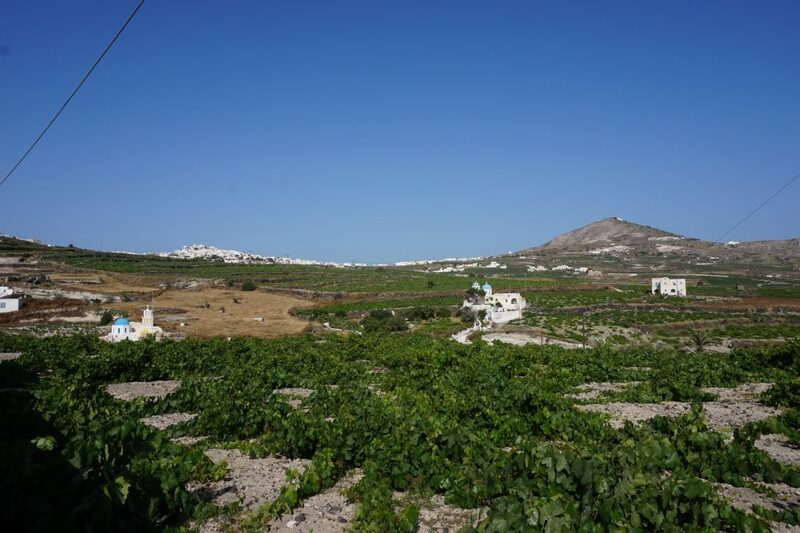 The next two most important white varieties are Aidani and Athiri, both of which are typically lighter and more aromatic than Assyrtiko and are usually blended. Mavrotragano and Mandilaria are two important reds, of which account for about ten percent of total production. 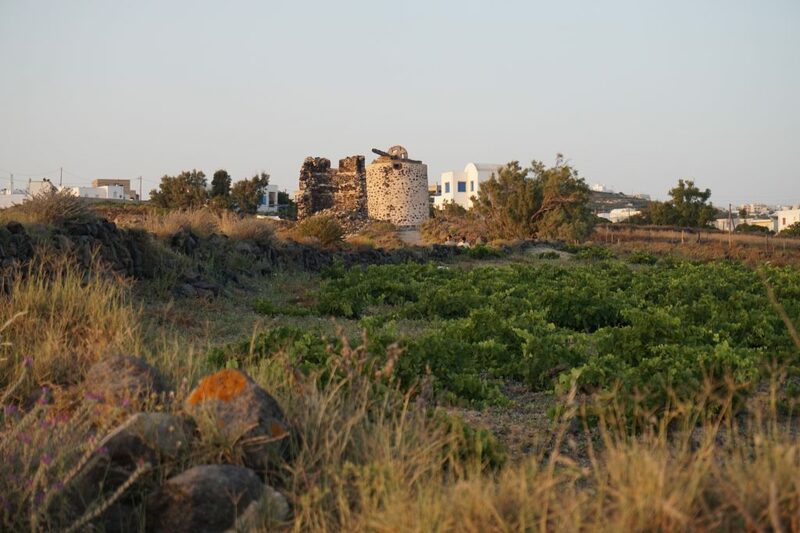 Over 90 different grape varieties have been recorded on the island although many are no longer cultivated. The predominant style is a fresh, unoaked Assyrtiko. Assyritiko produces wines that are full-bodied, high in acid, alcohol and extract and not particularly aromatic. 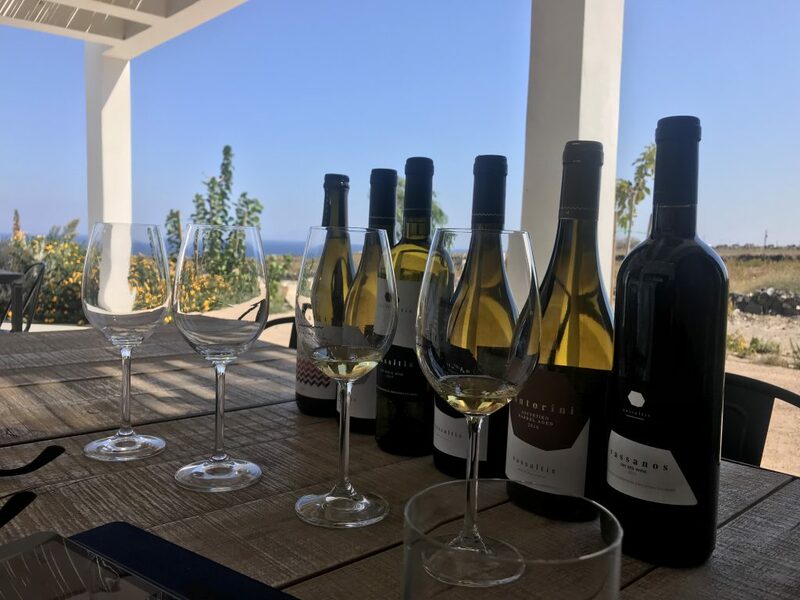 These wines are freshly citrus and salty and generally stun visitors to the island as perfect local food pairings. Oaked styles of Assyrtiko tend to be richer, softer and more caramel. Nykteri is a traditional late harvest style is often rich and honeyed. When blended with Aidani and Athiri, the wines tend to be broader and softer with floral aromas. Finally, vinsanto is the traditional sweet style made from sun-dried grapes that is luscious and balanced with great acidity. 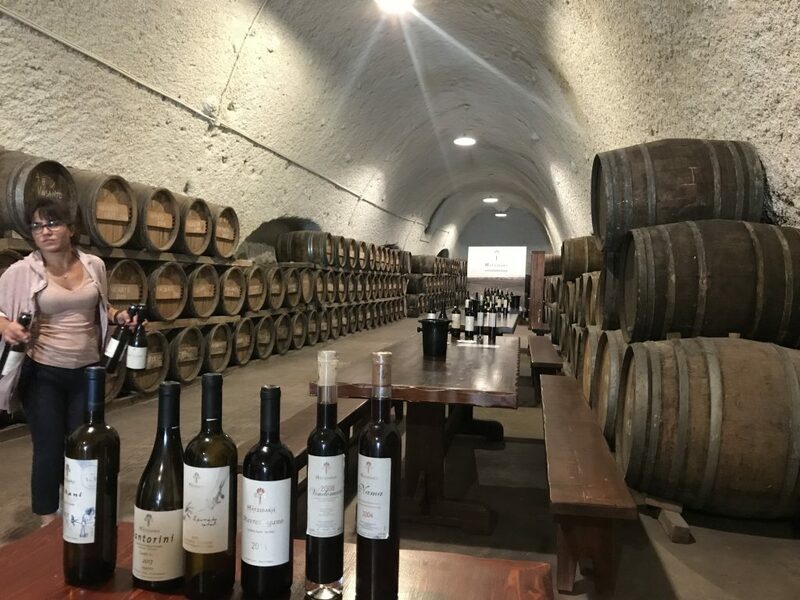 Read more about Greek wines in Part One and Part Two of our introduction to the wines of Greece.